It is spring. And all of the little creatures who have been quietly living in nests and dens all winter, eating what they stored away and patiently waiting for the snow to melt. This particular creature, and others like him, are hungry. All of the seedlings this creature ate are early. 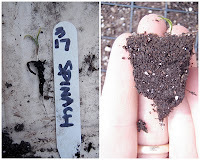 And having him eat them now means I know that he is around and can catch him before the really important "true" seedlings are growing- these were "baitlings". This is a learning/exploration opportunity. Lesson: root (rhymes with "brute") strength! This spinach, only one week old, has some roots. Even though the green, sun-absorbing, "edible" part of the minuscule plant is, well, minuscule, the roots are three to four times as long! It reminds me of a critical rule of architecture: when cantilevering, for every 1/3 unit of cantilever, 2/3 units of hidden length has to be anchored to allow for support.